For around 30 years the Church has enjoyed an exceptionally strong level of participation from West London’s Ghanaian community and there is monthly worship in the main Ghanaian languages on Sunday afternoon. The URC Ghanaian Fellowship (Ga Dangme-speaking) worship at St Andrews URC Ealing at 3pm on the 4th Sunday of each month. 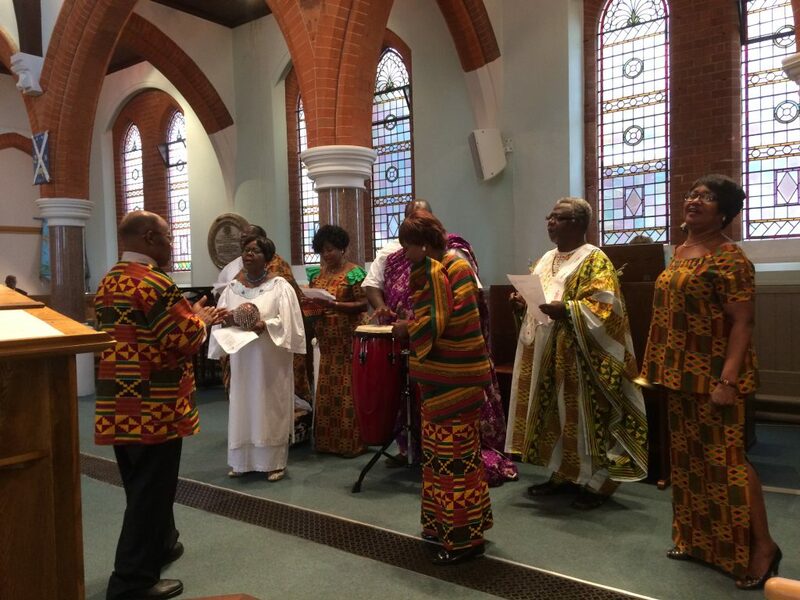 A number of St Andrews regular members also attend this service, which follows worship in the Ghanaian tradition. In an annual event, both congregations worship and fellowship together in a Joint Celebration Service. At this service, the varying styles of worship of the two congregations are fused together. The celebration ends with a ‘Bring and Share’ lunch. taake afeɔ yɛ ŋwei lɛ! Hã wɔ ŋmɛnɛ wɔdaa ŋmãa. Shi jiemɔ wɔ keje ɛfɔŋ lɛ mli. kɛ anumnyam lɛ, kɛyashiɔ naanɔ. Sedee yede firi won a wode yen aka. Na mfa yen nko sohwe mu. Animuonyam ye wo dea daa.